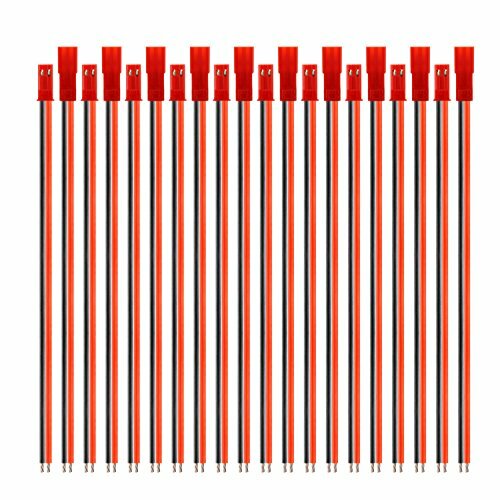 JST pigtail is mainly used for mini RC helicopter, indoor 3D plane, LED Light Strip, Li-Po battery, Esc Bec Board and NiMh battery connection and etc. SIM&NAT-JST adapter cable are made of high quality silicone as outside insulation and adopting tin plating copper wires as conductor, which great for all types of projects and avoid wires overheating and damaging your components. Total cable length: approx. 150 mm/ 5.9"
2 Pin JST connector, one side for plug the other side for welding. JST plug connector is suitable for most mini RC helicopter, LED strip light and good for connecting motor, ESC battery. JST connector cables with Tin plating copper as conductor have advantages of good electrical conductivity and high transmission rate and above all it does not heat easily, which is more safety and long service life.